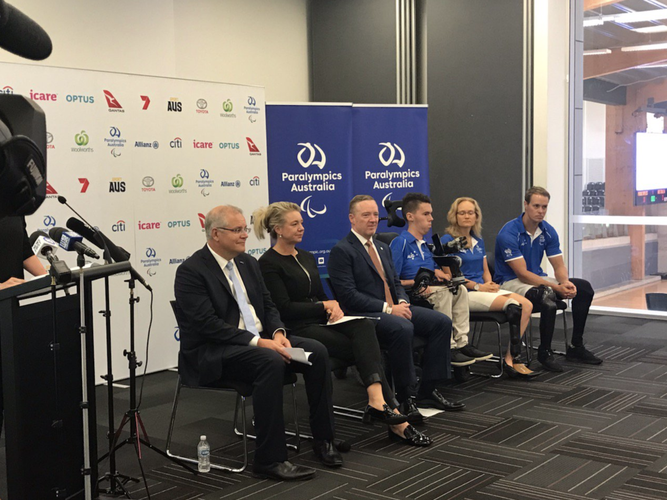 It’s been an exciting week for Australia’s para-athletes with the rebrand of the Australian Paralympic Committee to Paralympics Australia and the announcement of a major funding boost ahead of the Tokyo 2020 Paralympic Games. Prime Minister Scott Morrison announced a new funding investment of $12 million at the rebrand launch event in Sydney on Wednesday. Of the investment, $8 million will be used to effectively manage the planning, coordination and delivery of the Australian Paralympic Team aiming for success in Tokyo, with the other $4 million to be directed to the Victorian base for the construction of a Community, Education and Events Centre at its existing facility at Tullamarine. The new development will feature accessible accommodation and training facilities for Para-athletes and teams, as well as a Paralympic museum which will be managed in partnership with the Essendon Football Club. Prime Minister Scott Morrison says the funding commitment recognises the Australian Paralympic Team’s unique and increasing place within Australian sport and the value it brings to the public. “I am proud that the Australian Government will be the key partner in ensuring the Australian Paralympic Team has the best possible chance to shine on the world stage in Tokyo. He says Paralympic hopefuls can now prepare with confidence, knowing the funds and support that they need and deserve to represent our country are secure. President of Paralympics Australia Jock O’Callaghan labelled Wednesday a historical day for the Australian Paralympic movement. “This support will help to continue our wave of momentum heading towards Tokyo 2020 and beyond, so the benefits of sport continue to expand for people with disability, and ultimately lead to greater equity in all areas of life,” he says. Chairman of Sport Australia John Wylie says the work of Paralympics Australia in recent years sets an example for the whole sport sector. Chief Executive Officer of the Australian Paralympic Committee Lynne Anderson says the funding and support from the Government as well as the organisation’s ongoing relationship with Sport Australia signifies a huge boost in an ongoing challenge to attract government, corporate and community support. Minister for Sport Bridget McKenzie hopes the funding will inspire more para-athletes to become involved in sport and physical activity. The funding will significantly support Paralympics Australia as they prepare to send one of the country’s largest Paralympic teams to the Tokyo 2020 Paralympics, to represent the nation in more than 15 sports. With costs expected to tip over $10 million, Paralympics Australia aims to raise the outstanding $2.5million over the next 18 months through fundraising efforts, corporate sponsors and State Government support.